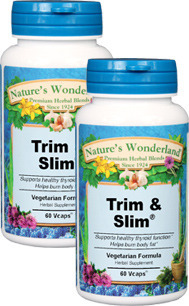 Trim & Slim® - 700 mg, 60 Vcaps™ each (Nature's Wonderland) - Penn Herb Co. Ltd.
As an addition to the daily diet, take 1 or 2 capsules three times daily with water at mealtimes. NOT TO BE USED DURING PREGNANCY OR WHILE NURSING, OR BY PERSONS WITH HYPERTHYROIDISM. NOT RECOMMENDED FOR LONG TERM USE.